Born To Run was Bruce Springsteen’s breakthrough album and a monster commercial and FM radio hit. But a three year legal impasse with his former (fired) manager delayed a follow-up LP until he released Darkness On The Edge Of Town on June 2, 1978. True to the title, it’s a subdued, deeper and somber exploration of the middle and lower-class people themes he’d introduced on his first three LPs, Greetings From Asbury Park in early 1973, The Wild, The Innocent And The E-Street Shuffle in late 1973 and the classic Born To Run in 1975. The time lag, the legal troubles and the weight of sudden superstardom after years of toil quite plainly took their toll on Springsteen. But the result was positive. Darkness… trades the exuberant rock & roll, romantic ballads and full production of its predecessor for a heavier and tighter sound of brooding cynicism, melancholy dirges and repetitive, thumping rhythms. 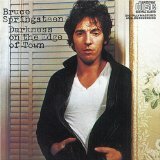 Although not a single Top 30 hit came off the album, there’s plenty of classic Boss music, with solid tracks like “Badlands,” “Adam Raised A Cain,” “The Promised Land” and “Prove It All Night.” For hard-core Springsteen fans and lovers of “deep cuts,” there’s “Candy’s Room,” “Factory” and the title track. Born To Run pushed him over the top, but Darkness… carried the Boss into a remarkable 25 year run atop the pop-rock heap. The album reached #5 on Billboard’s Pop Album in 1978 and was selected as the #1 album of the year by New Music Express. Rolling Stones ranks it as #151 on their Top 500 albums of all time. You can download my Springsteen playlist from the Playlist Vault, and Darkness… is on Amazon and iTunes.